apply weed control techniques and programs in a safe and efficient way. 1. Weed Identification: review of the system of plant identification, general characteristics of the weeds, further information, contacts, etc. 3. Chemical Weed Control: review of commercial and domestic herbicides, determining what differentiates them, their availability and use. 4. Weed Control In Specific Situations: understanding weed control strategies for particular situations, accessing first hand information about weed control from industry leaders and determining a weed control program for five different sites. 5. Safe Chemical Application: reviewing what types of chemicals and application methods are used in the industry and the required safety procedures for the handling and administrating chemical herbicides. 6. Non-Chemical Weed Control: determining any detrimental effects chemical herbicides have on the environment, reviewing non-chemical applications and their effectiveness. 7. Dealing With Specific Weed Control Problems: looking at current industry practices for weed control and the effects on the environment, in relation to specific weed control problems. 8. Developing A Major Weed Control Program: a practical lesson where the student can fully demonstrate their understanding of weed control by devising a weed management plan for a designated area. To understand the characteristics of different weed control methods. You will look at and consider 104 different varieties of weeds and prepare plant review sheets for 13 different weed plants. Plant 5 different varieties of weeds to study. Contact 4 or 5 of the larger chemical companies for leaflets on different herbicides. 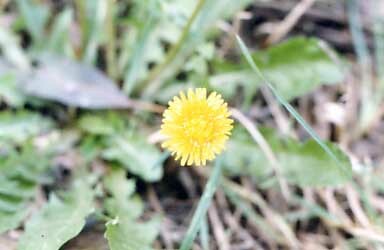 Visit and inspect five different sites where weeds are a problem. Visit several farmers who raise different types of livestock. HOW MANY WEEDS DO YOU KNOW? 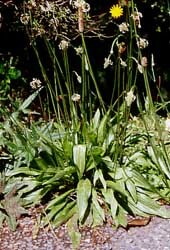 HEIGHT AND HABIT: this annual plant forms a rosette of lance-shaped, parallel ribbed leaves. The leaves often appear shiny or silky. The rosette can reach 10-25cm across depending on the rainfall and growing conditions. The flower stalks arising from the basal crown can also vary according to the location from 10cm to almost 35cms tall. The oblong pointed, brownish green flower head has a distinctive ring of lemon coloured stamens when the plant is in full flower. The plant usually has a strong, deep tap root. GROWING CONDITIONS: grows in neutral to alkaline soils in sands or clay loams, in dry positions in full sun. Usually found on roadsides and waste places. Prefers moist fertile soils. PROPERTIES AND FEATURES: does not like to grow in highly acid soils it has a wide range of herbal therapeutic properties. (Consult reputable herbals for details). METHOD OF CONTROL: generally easy to remove with a special flat weed cultivator/ lifter. Broad leaf weedicides are also available.